Littlehampton Football Club’s pre-season fixture programme has now been confirmed. Golds, set for a season back in the Southern Combination League Division 1 following relegation, have six friendlies lined up in preparation for the 2018-19 campaign. Interim manager Mitchell Hand left the club after failing to keep Golds in the SCFL Premier Division, with Nigel Geary announced as his replacement earlier in the summer. Since Geary’s arrival last month, coach Steve Tabor has left The Sportsfield following a 16-year association with the club as a player and then in the dugout. 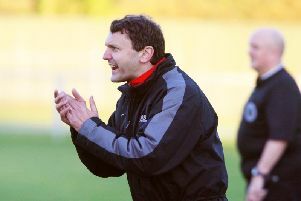 Ex-Worthing United manager and Lancing assistant boss Geary moved quickly to name Dave Jordan as Golds’ head coach. Jordan is currently working towards his Uefa B licence and is a level 2 coach. Littlehampton returned for pre-season training on Tuesday as preparations begin in their quest for an immediate return to the SCFL Premier Division. Pre-season fixtures: Sat, July 7, Upper Beeding (The Arena, Bognor, 3pm); July 14, Kent United (The Arena, Bognor 3pm); July 17, Montpeliar Villa (a) (8pm); July 21, Lymington Town (H) (7.45pm); July 24, East Preston (a) (7.30pm); July 28, Loxwood (The Arena, Bognor 3pm).